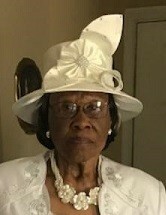 Ms. Artie Gree Moore, age 91, of 715 Curtis Circle, Spring Lake, NC departed this life on Sunday, February 3, 2019. Funeral services will be held on Monday, February 11th at 11:00 AM at Smith Chapel Free Will Baptist. She leaves to cherish her loving memories: four sons, Leroy Alfred, Dock Smith, Rochester Smith and John Moore; a host of grandchildren; a host of great grandchildren and a host of other relatives and friends. There will be a viewing held on Monday, February 11th from 10:00 AM to 11:00 AM at the church.